Click here for RealAudio version of Vent, 5:40/332K. Click here for TrueSpeech version of Vent, 354K. Click here for MPEG-2 version of Vent, 482K. Having produced seven widely divergent new works in the past two years, Keith Moore (born 1970, Urbana, Illinois) is an extremely active composer. 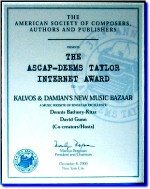 In 1996, performances of his compositions took place at Le Domaine Forget Modern Music Symposium, St. Irénée, Canada; Greenwich House Music School, New York, NY; June in Buffalo, Buffalo, NY; Horizons Experimental; School, Atlanta, GA; FUNMusic, Urbana, IL; College Conservatory of Music, Cincinnati, OH; and Fondation Royaumont, Asnières-sur-Oise, France, where he was a fellow last fall studying with Brian Ferneyhough and Klaus Huber. Mr. Moore began studying music at an early age, with his first compositions dating from 1982 and a freelance jazz and classical trombone career beginning in 1987. 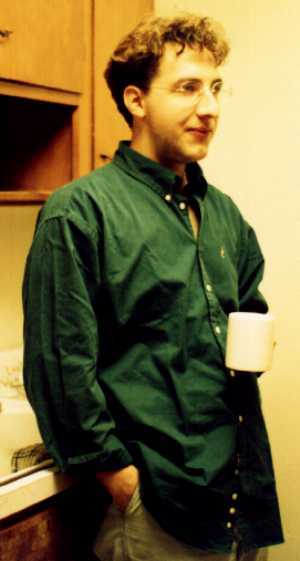 He received a Bachelor’s degree from the University of Illinois in 1993, studying with Zack Browning, Herbert Brün, Salvatore Martirano and John Melby. He completed his Master’s degree in 1997 at Wesleyan University in Middletown, Connecticut, studying with Anthony Braxton, Neely Bruce and Alvin Lucier. He was appointed visiting lecturer of theory and trombone at Wesleyan University from 1995 to 1997. In 1994 he founded the ThreeTwo Festival (recent music) which presents its fourth season this fall at New York City’s Greenwich House Music School. An active performer of new music, Mr. Moore recently appeared (as trombonist) on CNN, at the Lincoln Center Out-of-Doors Festival, the Lucier@65 Festival (which he co-curated), and with the Vector Ensemble. As a performer of live electronic music, he is a member of the Experimental Music Group which worked closely with David Tudor and was recently presented by the SEM Ensemble performing Mr. Tudor’s complete Pepsi-works. Mr. Moore has recorded for New Albion Records and is to be featured as one of three continuous soloists in a two CD set recording of Anthony Braxton’s music for the new Braxton House label. This summer Mr. Moore was a fellow at the Norfolk Chamber Music Festival, where his Shrubbery, Someone thinking about...and......from... (1997) was premiered. Extracts of this work were later premiered in New York City by Tomas Bächli as part of an homage to Liberace. This year he will be studying with Sir Harrison Birtwistle at King’s College London. Future plans include new works for the Duruflé Trio (Paris), Stefan Freund Trio (Rochester, NY), Marija Ilic (New York City), and a residency at the Eartalk Festival in Molyvos, Greece. Mr. Moore currently resides in New York City and is finishing a commission for the Musikfabrik NRW. Click here for the composer's resume. The Unfinished Polka (1996) for four saxophonists (two doubling clarinets), trumpet, trombone, accordion, harpsichord, piano, toy piano, three percussionists (9 tomtoms (L-H), 2 suspended cymbals (M,L), 3 wood blocks (S, M, L), 6 almglocken, 3 djembe, snare drum, bass drum, trap set, brake drum, marimba, vibraphone), two violins, and mezzo-soprano. VENT (1995) for bass trombone, violin, flute, clarinet, piano and 2 trumpets. From the Diary of an Organaut (1995), for organ solo. hiatus pitch (1992, revised 1994-95) for solo alto saxophone. Vagrants on Every Floor (1994) for six cellos. Vagrants on Every Floor (1993) for violin alone. Citizen Arrest (1993) for four musicians with alto saxophone, E-flat clarinet, flute, snare drum, tenor saxophone, trombone, trombone with F-tuba mouthpiece, and trumpet. hiatus pitch (1992) for solo alto saxophone. Quartet (1990-91) for bassoon/contrabassoon, French horn, tuba and viola. Poem in 16 Stanze (1991) for solo reciter. Music for Percussionist and Composer-Lecturer (1990). An Opera in Five Acts (1989) for five speaking voices. Three Piece (1989) for alto saxophone, baritone saxophone, E-flat clarinet, French horn and piano. Conception (1988) for solo flute. Quartet (1987) for trombone and euphonium with multiphonics. Nascence (1987) for brass quintet.